Tone and strengthen your body from head to toe with this high-energy workout that combines aerobic and strength-training exercises. 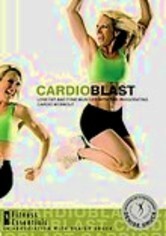 Fitness expert Denise Druce leads you through vigorous fat-burning cardio routines and muscle-toning drills. Viewers who are looking to challenge themselves even further have the option to increase the difficulty of the workout by adding dumbbells or steps.